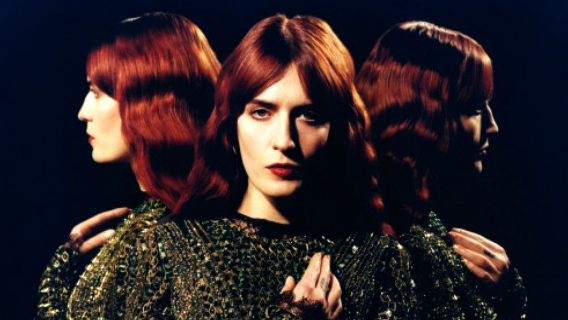 Florence + the Machine obtained commercial and critical success by releasing music with a distinct sound and feel. Although her works are often covered by mass media, one aspect of her act is rarely mentioned: the esoteric symbolism of her songs and videos. We will look at the meaning of the videos “Shake it Out” and “No Light No Light”, two enigmatic videos from the album Ceremonials. Despite this known fact, I never found any review or analysis of Florence + the Machine’s work from an occult point of view, a field Florence Welch is obviously well versed in. The videos of her first album Lungs had some occult concepts infused into them. For example, her hit Dog Days are Over alludes to the dog star Sirius, an all-important celestial body in esoteric teachings (for more information, read the article entitled The Mysterious Connection Between Sirius and Human History). An article on Pseudo-Occult media described some of the occult and MK aspects of the videos from her first album – centered around the imagery of white rabbits, bird cages, Alice in Wonderland and so forth – so I won’t dwell on those. Her second album, Ceremonials, is slightly darker and more focused on profound esoteric concepts that deserve some analyzing. The videos of Shake it Out and No Light No Light both contain enigmatic imagery (see the confused comments on YouTube) that relate to ancient occult concepts. Analyzed from an esoteric point of view, both videos can indeed by seen as “ceremonies” where symbols and colors describe a story of profound transformation. The imagery of Shake it Out tell the story of an initiation ritual in a strange secret society while No Light No Light describes a profound spiritual change in the context of duality. We’ll look at the esoteric meaning of both videos. In this strange setting, there are several Florences, with different personalities and wearing dresses with symbolic colors. Each of them tell a different part of the story of Florence’s initiation and its results. As we have seen in previous articles on this site, the theme of initiation is often found in modern pop videos and there is one thing they all have in common: a focus on the colors white, red and black. This video is no exception as the color of Florence’s dresses tell alot about the meaning of the character she is embodying. At the beginning of the video, Florence wears a pearl/gold colored dress and looks shy and almost reticent as she enters the ball. She is obviously the “guest of honor” but she is unsure of what she is walking into. As she enters the ball, she is greeted with strange cloaked and mask figures. Some of them are quite weird but interesting. A mask representing Hypnos, the Greek god of sleep – from which the term “hypnosis” comes from. He is the twin of Thanatos, the god of death and His palace was a dark cave where the sun never shines. At the entrance were a number of poppies and other hypnogogic plants. 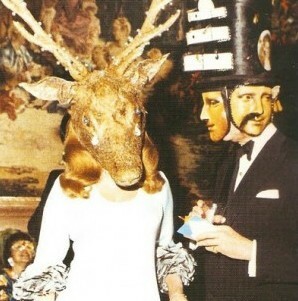 Baron Alexis de Redé (right) wearing a similar multi-face mask at an actual Rothschild ball in 1972. The ceremony is centered around her and with good reason: it is her initiation ritual. One of the figures blindfolds Florence. The blindfolding of new initiates is an intricate part of Masonic-like rituals and bear a very symbolic meaning: they represent the candidate’s prior blindness and ignorance. Image taken from Duncan’s Ritual of Freemasonry describing the initiation of a new Mason. He is blindfolded and walked around the Lodge. The lyrics of the song sustain the overall theme of these kinds of initiations as they pertain to the abandoning of a dark past and the embracing of a new life. Some parts of the song are particularly interesting as they appear to allude to specific aspects to Masonic initiations. This following passage refers to candidates being “in the dark” before the completion of the initiation. This last line is also similar to a portion of the Masonic oath. Whether or not these allusions to secret societies were intentional, they definitely give a sense of “spiritual rebirth” to the song. In another scene where Florence plays the role of “new initiate”, she is shown taking part of a séance to communicate with spirits, confirming the occult nature of the gathering. In another part of the video, Florence is dressed in red – the color of sacrifice and initiation – and has a completely different demeanour. She is unrestrained, dances frantically and appears to be slightly possessed. While she seems to be having the time of her life, she also appears to be consumed and disturbed by whatever is effecting her. Another Florence appears to be a result of the initiation: a pure and angelic Florence dressed in white, symbol of purity and innocence. She runs out of the party and climbs on a tree, looking godly and at peace. A forth persona is shown in the video: a cool, calm and powerful Florence dressed in black formal wear – symbolizing the full-fledged society member. Florence dressed in black in a private setting – dancing with two masked men. Florence’s initiation appears to have generated two results: a Florence dressed in red, who appears to be drunk on the world’s materiality and animal impulses, dancing without restraint and embracing her sexuality and a Florence dressed in white who leaves the ball to go on a tree (symbolically leaving the earthly realm to ascend towards the spiritual). The balance between these two opposite forces is at the basis of hermetic concept of duality. This all-important theme also appears to be central to Florence’s second video, No Light No Light. No Light No Light has none of the subtlety of Shake it Out. It rather violently clashes two diametrically opposing forces battling for nothing less than Florence’s soul. The imagery of the video is based on contrasts and opposites, using concepts such as light and darkness, good and evil, black and white, civilization and tribalism, church and sorcery and so forth. The two main scenes of the video that are pitted against each other are so clichéd that they border on caricature: an entranced voodoo doctor practicing black magic versus innocent church choir boys. The opposition is vivid, yet both worlds appear to be part of Florence’s experience (she was in choir during her youth, while also dabbling in occultism). The two scenes bring up an almost archetypal sense of good and evil, thus symbolically representing the eternal struggle that is happening within Florence’s soul. The first scene shows a masked man, sitting in the dark, in front of lit candles and a voodoo doll. The shaman is inside a Masonic Lodge. Although it is dark, we can notice the Masonic throne, the Blazing Star above it and the all-important checkerboard-patterned floor. The shaman sticking a needle inside a voodoo doll. The Masonic checkerboard floor is the space on which occult rituals and ceremonies take place. The black and white pattern represents the coexistence of good and evil repeated in an infinite pattern and is therefore a visual representation of the concept of duality. Like the checkerboard pattern, the video visually depicts the eternal fight between two opposing forces in the spiritual realm, but it uses human figures instead. Opposed to the voodoo shaman is another evocative image: young choir boys inside a church. Florence appears to be under the spell of the shaman as he hurts her by sticking needles inside the voodoo doll. At one point, Florence lets go and embarks into a gigantic free-fall from the top of a tall building. She crashes through the church’s stained glass ceiling and floats in a burst of light. Florence enters the church from above, floats in mid-air and takes a position that makes her appear to be Christ-like. This symbolic image refers to the Gnostic concept of “inner-Christ”, where salvation and godhood is obtained from within by illumination. Florence is then caught by the choir boys and carried somewhere. Her embrace of “good” apparently kills the voodoo doctor who begins convulsing. By banishing the evil that had control of her, Florence attained Gnosis and therefore became “like Christ”. This video has caused controversy because it was deemed racist. These observers claim that the “bad guy” is a stereotypical tribal-voodoo shaman and is, in fact, a “black face”, a non-black person painted black, like they used to do back when media was openly racist. At one point during the video, we see Florence, a red-headed white woman running away from evil that is represented by a black guy. It is also noted that she is saved by a European choir that is exclusively composed of white boys. With that being said, can we truly say that the video is purposely racist? I honestly cannot say and that is not the point of the article. I can, however, say that race is indeed used in a symbolic way to emphasize the occult concept of duality and to further develop the sense of opposition between the two scenes. As said above, humans are used in this video to depict abstract the concept of struggle between opposing forces, as depicted by the symbol of Ying and Yang. The struggle is happening inside of Florence, on a spiritual level, hence the spiritual imagery of the video. Everything about these forces is opposed, including their skin color – white and black – as they become an embodiment of the checkerboard pattern floor. White is traditionally associated with good and black with evil. This unfortunately translates very badly when it comes to skin color but the direction of the video appears to have taken this bold step anyways. The lyrics of the song further accentuate the concept of struggle between good and evil. While it can be interpreted as a song to a lover, the vocabulary that is used, along with the video’s imagery, alludes to a spiritual struggle. The entity she is speaking to appears to have an ethereal quality as she mentions she is witnessing A revelation in the light of day. With that being said, who or what is she talking to? To God (who brings revelation)? The Devil (who is said to have blue eyes)? There is a definite sense of ambiguity which only emphasizes on the concept of duality, where opposing forces are part of a greater whole. In other words, good and evil, God and Satan are considered to be “two sides of the same coin”. Florence + the Machine’s videos for Ceremonials indeed include a great deal of ceremony and ritual. Through the symbolism and color codes found in the videos, Shake it Out and No Light No Light both tell stories that take place on the esoteric plane, mainly involving the all-important concept of duality. The first video is centered around the concept of initiation in the context of a high-society masquerade ball (sometimes referred to as an Illuminati ball). The second video opposes spiritual figures representing good and evil that border on caricature, where Florence, a soul in peril, frees herself from the spell of a voodoo shaman to be saved by a church choir, which represent her own good and dark side. That being said, one can argue that it was the shaman (her dark side) who pushed Florence towards her own enlightenment. Is he therefore truly evil or simply part of a greater scheme? That is the mystery of duality and these are the esoteric concepts that transpire from Florence + the Machine’s works. Does that make her message good or evil? To quote her words: “Looking for heaven, for the devil in me“.